A father saved his wife and four children from their burning home in the unincorporated community of Trona in San Bernardino County Saturday, Feb. 6, 2016. 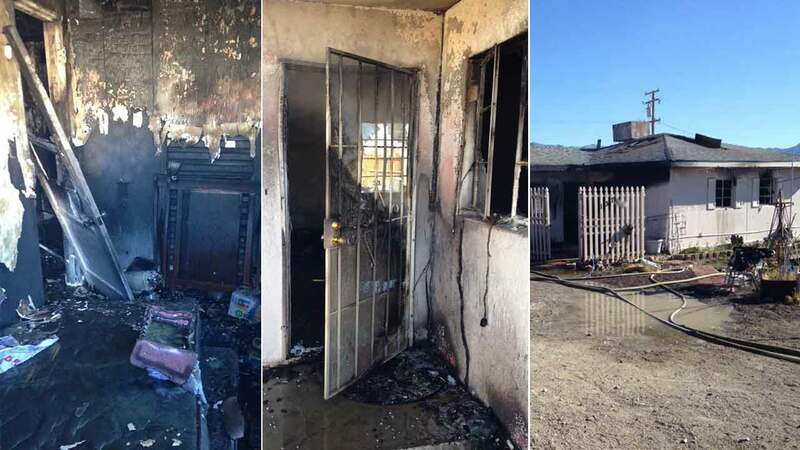 SAN BERNARDINO COUNTY, CA -- A father is being considered a hero after saving his wife and children from their burning home in the unincorporated community of Trona in San Bernardino County Saturday morning. Firefighters responded to reports of a house fire in the 13700 block of Benton Street in the rural area around 7:23 a.m., according to a press release from the San Bernardino Fire Department. Prior to fire crews arriving, the father evacuated his wife, four children and two dogs before the raging blaze destroyed the home. The man told officials his young son woke up to the smell of smoke and immediately alerted him. When the man walked out to the hallway, he saw the home filled with smoke and flames. Upon arrival, firefighters immediately rendered medical aid and transported the victims to a nearby hospital. The two adults suffered 2nd-degree burns, while the four children suffered 1st degree and superficial burns. No injuries were life threatening, according to San Bernardino fire officials. San Bernardino County firefighters, along with Searles Valley Minerals Fire personnel were able to get the aggressive blaze under control within 25 minutes, the press release stated. The cause of the fire was under investigation but San Bernardino County Sheriff Arson/Bomb investigators believe the blaze may have started in a wall heater. The home was completely destroyed by the fire and the American Red Cross requested to assist the displaced family. It was not immediately known whether the home had working smoke detectors at the time. San Bernardino County fire officials said they urge residents to practice a fire escape plan and make sure to have two means of escape from every room. They added it was critical to make sure everyone knows where to meet after leaving a burning home.